What’s you simple or guilty pleasure? My name is Tracey Marie and my very simple guilty pleasure is skipping. Yes that’s right, skipping, not the kind of skipping with a rope, the kind where one bounces along, the type of skipping that we did as children hand in hand with our best friends. An activity I believe we are supposed to perhaps grow out of but I ask why? I usually skip when I’m out walking my dog in the middle of nowhere and when there is absolutely no chance of anyone seeing me. Occasionally when I can’t contain my happiness I might skip in public, and a few of my readers will have even witnessed me doing this. I have even been known to skip across the floor at work, which just causes people to smile and wonder if I’ve been drinking. So what makes me want to skip? It is when I feel free and happy and it also makes me feel light. I’m also not very good at running and by skipping I can cover more distance than when I’m walking. I was recently out with a friend and as we crossed the Thames over the Millennium Bridge I started to skip. My friend laughed and asked what I was doing and I replied “skipping, try it”. She also joined in. Not only did we find ourselves laughing and skipping higher but other people started to engage and smile. Some mornings, particularly sunny ones, when I walk across London Bridge on my way to work I want to skip, mainly because I’m happy and also because it’s a good way of moving faster without actually running and of course great exercise. However, something stops me, I worry about what people will think of me, will they think I’m mad? Yes probably, but as my friend pointed out people run and jog so why shouldn’t we skip if we want to. After all, who would have thought that the childhood activity of travelling on a scooter would have become an acceptable mode of transport for adults a few years ago? In London we now see many commuters using them to get from A to B more quickly. Could it be we are secretly wishing to engage in some childhood activities? So, it’s out there in the open now. I love to skip but as yet I haven’t had the courage to do so on my morning commute still worried by fear of what people may think, but as I grow older or should I say wiser I am beginning to worry less and less what people think. The key after all is to be happy. So when you next see someone skipping to work it may well be me. 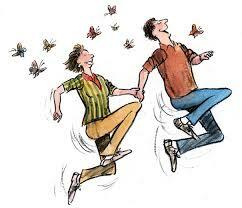 So please don’t laugh at me just join in, you never know you might also discover the joy of skipping. I would love to hear from you and what your guilty/simple pleasure is or anything you like to do that makes you happy but don’t have the courage to do so for fear of what people might think of you. Wishing all my lovely readers a wonderful week full of love and happiness. I’ve recently been asked what has happened to my Blog and whether or not I’ve changed my settings because they hadn’t received it. This has been both flattering and encouraging because it means that not only is my Blog being read and followed but it has also been missed and for that I thank you, my reader, very much. However, I must confess, that over the last couple of months my Blog has unfortunately taken a back seat. With the arrival of spring and the longer days I’ve been spending more time with my horses and just being outside in nature. Spring is a wonderful time of year full of promise of things to come. I have been living in the moment and have enjoyed watching the new leaves uncurl, the grass grow longer and greener and the bluebells bloom with their intoxicating perfume which can be smelt throughout the woods. The beautiful lambs born just a few weeks ago are now growing and slowly becoming bolder and moving further away from their mothers to play with their young friends. The Swallows have arrived from the south and are busy making their nests in the rafters and marks the start of warmer weather. For me spending time outside and in nature helps me forget about work, and the stresses from everyday life just flow away and no longer seem important. So whilst I’ve been busy enjoying the arrival of Spring I’ve not been doing much else. As a result, my garden is beginning to overgrow, books remain unread, housework has taken a back seat (not that I’m complaining about that though as it is my least favourite chore) but more recently I’ve felt out of control, unable to find things around my home which is a sign to me that I need to put things back in order and to restore some harmony. You could say I’ve let the grass grow under my feet. I’m a Libran and by nature we like to feel balanced and in control of our lives and if something is out of kilter then our equilibrium can become upset. I am a great believer that in our lives we need to maintain a good mix of all things we enjoy to help keep a healthy balance. I realise I’ve been accepting invitations to lunches and dinners, rushing from one thing to the next and not making much time for myself. I need to slow down again and enjoy some “me time” to restore my inner peace and harmony. “Me time” is different for each and everyone of us, for me it is slowing down, just pottering around, listening to music, catching up on some reading and writing, especially my Blog. I enjoy writing my Blog but I never wanted it to become a chore and just lately I felt I had a list of things to do and felt somewhat bogged down by everything so along with everything else it had unfortunately taken a back seat. I’ve entered some more competitions with my young horse (Bee) which again takes dedication, not to mention learning to drive a horsebox with him on board. It’s all exciting stuff that I am looking forward to but equally it is time consuming so some things have had to give. I believe that today we are busier than ever and to remain healthy it’s important to maintain our equilibrium. This also includes maintaining a healthy lifestyle and eating a healthy and balanced diet. The saying of we are what we eat is so very true and it also fuels our body. So now I have recognised I have been a little bit off kilter, I’ve made some good old fashioned lists and prioritised what needs to be done and what can wait. I am now learning to say no to the unimportant things in my life so I have more time to do the things I enjoy and to spend my time and energy with the people and things in my life that I love. It came as no surprise to me to find my Blog was at the top of my list. It is important to me, so this weekend I decided to start writing it again. Equally, it’s important to me that I don’t get stuck by rigid lists of things to do and I still want to maintain a degree of flexibility and spontaneity in my life to maintain fluidity and harmony so I can still move forward and develop. We should never get so rigid and stuck that we cannot move forward. 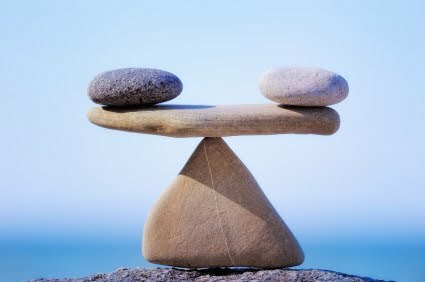 There are many strategies of keeping equilibrium in one’s life and I would really love to hear how you keep a healthy balance in your life and what strategies you use to maintain a healthy balance or equally you might be feeling out of balance and want to get back on track. Next week I will be writing about one of my very simple and guilty pleasures so be sure not to miss it and if you would like to receive my Blog straight to your in box please sign up. Wishing my readers a happy, love filled week full of peace and harmony.